The 2014 Ford Endeavour is available in three variants: 2.5 Liter Duratorq TDCi 4×2 Manual Transmission, a 3.0-Liter Duratorq TDCi 4×2 Automatic Transmission and a 3.0-liter Duratorq TDCi 4×4 Automatic Transmission, that will be available at Rs. 19,83,898, Rs. 21,28,119 and Rs. 23,06,302 respectively (all prices Ex. showroom Delhi). 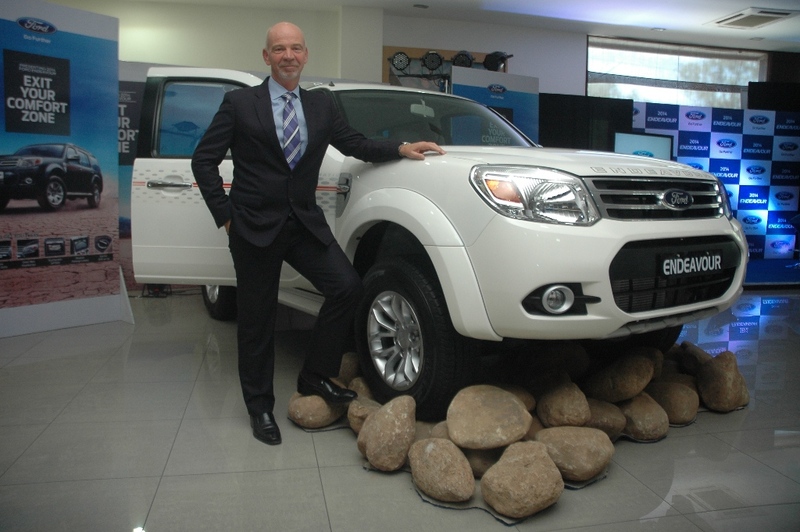 The 2014 Ford Endeavour was launched today in Chandigarh by Nigel Harris, President Ford India. The interiors of 2014 edition have been refreshed with trim updates and sport comfortable new leather seats to make the longest of journeys comfortable. The high-end touch enabled SATNAV entertainment system with Navigation Bluetooth audio control and reverse parking camera are new offerings in this SUV. 2014 Ford Endeavour has been enhanced to accentuate the vehicle’s overall appeal, making it tough and rugged while stylish and premium at the same time. The 2014 Ford Endeavour continues to be powered by a responsive 16-valve Duratorq TDCi powertrain which features outstanding torque output. The 3.0-liter Duratorq TDCi common-rail powertrain peaks at 380 Nm of torque at 2500 rpm with 156PS of power, delivering thrilling performance. The trusted SUV will also be sold with a 2.5-liter Duratorq TDCi with a 4X2 manual transmission. The Ford Endeavour has also been adjudged the most dependable vehicle in its segment by JD Power Asia for three consecutive years and underpins Ford’s philosophy to ‘Go Further’ in delivering more for the India consumers.